A light shade of marble looks exceptionally bright and clean when installed in the bathroom. The near-white color is accented by gray or light cold streaking patterns, complementing the jewel tones of the bathroom quite nicely. A popular style of white marble is Calacatta, a specialized type of marble from Italy and other parts of the Mediterranean. This family of light-shaded marble is extremely difficult to come by. An alternative is Bianco Dolomiti, an beautiful stone that is nearly pure white in color, streaked with thin gray veins. Nalboor Tiles is proud to exhibit the finest quality Bianco Dolomiti on its showcase pages, and customers are invited to compare this wonderful marble style to the more expensive Calacatta Gold. Stonexchange offers top-quality Bianco Dolomiti tiles to the public as well as to commercial clients such as construction companies, flooring product retailers, and home improvement outlet stores. We are a direct importer and distributor of natural and engineered stone products, and our marble line is represented by some of the most sought-after marble shades in the building industry. One of our newest additions to our line of natural marble stone is Bianco Dolomiti, a perfect replacement material for building orders specifying Calacatta or similar shade product material. Bianco Dolomiti is a natural marble stone. It is a beautiful milky white shade that is accented by light gray vein patterns. This combination of colors results in a distinctly authentic look for the foyer or bathroom. The gray streaks give the stone tiles a soft yet elegant appearance, and the color of this material complements both medium and dark shades as well as greens and blues so often used to decorate the bathroom. Many shades of marble have swirl patterns that make for a large number of placement possibilities. Bianco Dolomiti is an exception because the streaks are rather straight and parallel. This means that care must be taken when considering a placement pattern. However, the result is incredibly pleasing, as the individual stone tiles can be placed to create the appearance of a single, very large block of marble. When ordered in bulk quantities, Bianco Dolomiti is priced quite favorably versus Calacatta Gold. The latter has a soft pattern of gray and yellow streaks, the result being a more colorful yet less stately appearance. The high cost of Calacatta marble has resulted in an increased popularity in Bianco Dolomiti, and Stonexchange makes this product even more affordable through the direct import/distribution process. Our Bianco Dolomiti tiles are available to the public in small order quantities, but the real savings come when bulk orders are placed by commercial clients. We import this natural stone in oversized, ocean freight containers, and we pass the savings along to the purchaser. Our products are manufactured at fabrication centers operated by our own company or through a partnership. This results in fantastic per-piece costs for the buyer so long as full-pallet orders are bought as a single purchase. White and off-white marble styles are popular for high-end projects such as hotels and resorts. The Bianco Dolomiti tiles offered on the Nalboor Tiles website are priced according to the amount ordered, with large purchases of more than 4,000 square feet resulting in the lowest piece cost. Compared to the more well-known Calacatta Gold, the savings per-piece are worth considering. 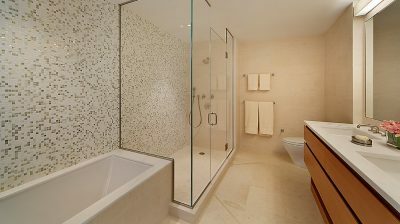 Of course, it is up to the actual property owner to decide which style is best for the bathroom or other interior space. What makes Bianco Dolomiti stand apart from its competitors is the end result after installation is complete. The entire rooms seems to be carved out of one gigantic piece of natural marble, and the secondary accent possibilities are virtually limitless. Commercial contractors will need a large amount of white marble stone to complete the bathroom floors and/or walls of a large development project. The same is true for those installers needing to replace marble tiles in a major hotel renovation. This is where the price savings come into play on bulk orders of natural stone purchased through Stonexchange. Competing marble styles such as Calacatta Gold or Bianco Venatino are often limited in supply due to high demand. The reliability of product inventory is questionable at times, and the lead time for processing and delivery can be as long as six months. On the other hand, top-quality Bianco Dolomite is available through Stonexchange throughout the calendar year. We maintain a large inventory of this natural marble stone at our distribution center in Miami, Florida, and we deliver to customers nationwide. Our premium quality Bianco Dolomiti is the perfect choice for luxury interior design, especially bathrooms. It can be used to cover both the floor and walls, and the tiles are often placed in the shower stall as well as the sink area countertops. Because of the extreme popularity of this color shade and the endless possibilities for placement, we offer these tiles in a variety of sizes. Besides the standard 12-inch square tiles, we sell Bianco Dolomiti in 12′ X 24″, 18″ X 18″, and 24″ X 24″ sizes. We even carry the extra-large 36-inch square slabs in 3/4-inch thickness. The latter size is perfect for large floor plans or for wall coverings in larger shower stalls where inset pieces will not be used. Prices for this product varies and depends on the individual piece size, thickness, and number of pieces ordered. However, individuals needing just a few pieces for a DIY home remodeling project are invited to compare the prices offered by Stonexchange against the price advertised by retail merchants. The direct importing and distribution of high-end quality tiles such as Bianco Dolomiti means savings for merchants as well as for individual consumers. One of the problems with luxury marble tiles is the cost variation resulting from limited quantities at certain times of the year. This fluctuation is considered normal in the industry, but the source of the problem has to do with small amounts of material being quarried and processed. This is often out-of-step with the building season and can cause a real headache for merchants wanting to please their regular customers, namely installers and subcontractors. Stonexchange offers the perfect solution to this dilemma. We maintain a huge supply of Bianco Dolomiti and other light shades of marble in our Florida warehouse, and we process large orders in just a few business days. This is the advantage we offer to commercial clients nationwide, especially those needing large quantities of material on short notice. Best of all, we do not charge extra for mixed orders, and our freight costs are kept to a minimum because we import only full containers of material. We contract with local and nationwide freight companies and can guarantee our clients the lowest shipping costs in the industry. If you need a reliable source of top-quality, high-end marble for your commercial customers, consider purchasing direct from the manufacturer and importer. We guarantee the quality of our product, and we also guarantee product availability whenever you need marble tiles. Bianco Dolomiti is a preferred color shade of marble when the installation project calls for natural stone in the bathroom. The reason many clients desire this color pattern has to do with how well the stone will look when set next to other shades and other materials. Although Calacatta Gold is brilliant in color and reflect light quite well, some interior designs will simply not work when this shade is used as the primary accent in the bath, foyer, or kitchen. This limits the design possibilities as well as any future changes the owner might want to make in the bathroom. Once Calacatta Gold is installed, certain color combinations cannot be considered in the future. Bianco Dolomiti allows for a greater amount of redesign and refurbishing without having to replace the marble itself. Nalboor Tiles is the online showcase for the stone tile products available from Stonexchange. We invite all interested parties – homeowners, retail merchants, and subcontractors – to give our product pages an extended look-over. The product styles are clearly illustrated, and all size specs are given for each type of marble tile. Remember, we are a direct importer of natural stone for the bathroom, kitchen, living area, and outdoor patio. Our delivery service allows clients to mix-and match orders, and our manufacturing process allows us to consider non-standard sizing on orders, even if it means custom fabrication. We are happy to perform this service at no extra charge, and if there is an extended lead time required for the fabrication of custom products or accessories, we will give an accurate delivery date. Clients can receive price quotes online by contacting Nalboor Tiles or Stonexchange. We will take your order query and give an accurate per-piece material cost as well as an expected delivery date. Merchants, give us a chance to show you how you and your customers will save money on top-quality Bianco Dolomiti marble.